This MRI system allows 3 T whole-body imaging for clinical applications and for studies in large animals. It includes a Brain coil (8 channel phase array) and a Cardio Coil (8 and 32 channel phase array). The scanner provides multi nuclei technology for low gamma nuclei such as 13C, 23Na and 31P. Dedicated RF coils for 1H, 13C and 23Na, both commercial and developed in-house, are also available, including RF coils for small animal studies to be integrated with the clinical scanner. 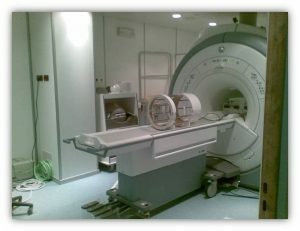 This MRI system allows 1.5 T whole-body imaging for clinical applications and for studies in large animals.